November 9th, 2009 Posted in eco hero, global warming, science, water, world | 735No Comments »http%3A%2F%2Fwww.ecojoes.com%2Ftime-lapse-proof-of-crazy-ice-loss%2FTime+Lapse+Proof+of+Crazy+Ice+Loss2009-11-10+00%3A58%3A44ecojoehttp%3A%2F%2Fwww.ecojoes.com%2F%3Fp%3D735 Make sure you like EcoJoes on Facebook to stay updated on green ways to save money and help the environment. Just click the "like" button below. Muchas gracias! Man, it’s been a busy as heck couple of months. First, I’ve been busy with a brand new job, developing the web software of tomorrow, today. Second, I just yesterday got back from mi luna de miel. What with that and helping with wedding planning, my life was purty dang busy. Anyhoo, enough about me. What I bring to you today is a good video from TED Talks showing time lapse proof of extreme ice loss. James Balog, a photographer, founded the Extreme Ice Survey to capture the changing glaciers by time-lapse photography and video. His goal is to show everyone visual proof of just how fast glaciers are melting. Without any further ado, I bring to you his talk. February 25th, 2008 Posted in energy conservation, free, global warming | 1362 Comments »http%3A%2F%2Fwww.ecojoes.com%2Ffree-global-warming-stickers-to-help-polar-bears%2FFree+Polar+Bear+Stickers+to+Curb+Global+Warming2008-02-25+15%3A40%3A43ecojoehttp%3A%2F%2Fwww.ecojoes.com%2Ffree-global-warming-stickers-to-help-polar-bears%2F Make sure you like EcoJoes on Facebook to stay updated on green ways to save money and help the environment. Just click the "like" button below. Muchas gracias! If for some reason you think you’re better than the rest of us, and feel you can somehow do more than just ordering free polar bear stickers, then you can find out other ways to curb global warming rotch here. So please, act now. If not for yourself, then for the baby polar bears. January 14th, 2008 Posted in free, global warming, winter | 88No Comments »http%3A%2F%2Fwww.ecojoes.com%2Ffree-save-the-snow-sticker%2FFree+Save+the+Snow+Stickers2008-01-14+15%3A59%3A02ecojoehttp%3A%2F%2Fwww.ecojoes.com%2Ffree-save-the-snow-sticker%2F Make sure you like EcoJoes on Facebook to stay updated on green ways to save money and help the environment. Just click the "like" button below. Muchas gracias! Edit: If you click the sticker, it’ll take you to the place to get free “Save Snow” stickers. I messed up the link earlier. 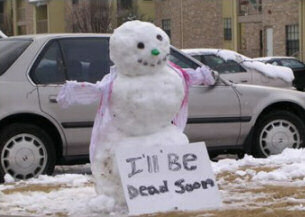 My B.
I come to you today as a representative of a vanishing species of snow-people. My people used to have a proud way of life, replete with ancient traditions and snow-cow sacrifices. But now, we are being hunted to extinction by Brother Sun. Please, get yourself a free “Save the Snow” sticker now, before it is too late. October 22nd, 2007 Posted in global warming | 341 Comment »http%3A%2F%2Fwww.ecojoes.com%2Fvideo-of-north-pole-ice-shrinking%2FVideo+of+Arctic+Ice+Shrinking2007-10-22+15%3A45%3A54ecojoehttp%3A%2F%2Fwww.ecojoes.com%2Fvideo-of-north-pole-ice-shrinking%2F Make sure you like EcoJoes on Facebook to stay updated on green ways to save money and help the environment. Just click the "like" button below. Muchas gracias! Sadly, this post isn’t about helping the environment and saving money. It’s about global warming. It’s not about how much of it is man-made and how much is happening naturally, it’s just to show how fast some big changes are happening. 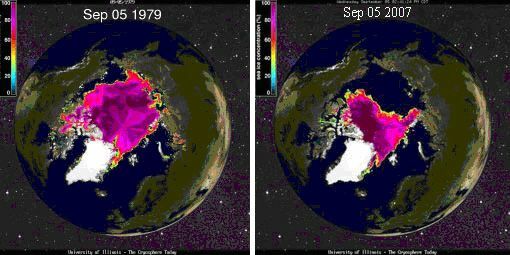 This picture shows the North Pole in 1979 and then in 2007. The pink area is arctic ice; the darker the pink, the thicker the ice. That’s a pretty big decrease in ice cover, but it is over 28 years, so maybe it’s not all that bad. But look at this video from NASA showing the north pole from September, 2005, to September, 2007 (only two years!). In just the last two years, a huge amount of artic ice has melted. Whether it is because of man-made pollution, or natural warming, a change this big should not be ignored. To paraphrase Nelly, “It’s getting hot in hurr”.